I should have made his legs shorter, but other than that I think I did a pretty good job considering he’s my first deer. Well, he has antlers so maybe he’s a stag but he’s small, so deer seems more appropriate. Also he’s made of logs and sticks so it probably doesn’t matter. I also forgot to give him a proper name but he responds to “Deer” and seems to like it. I could have added hinges to his legs, maybe, that might have helped. 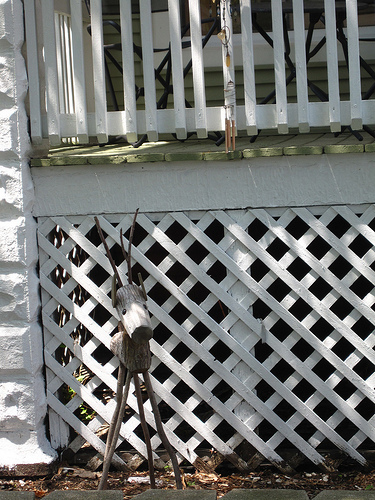 He walks with a wobbly, uneven gait on his too-long legs. I worry he’s going to fall down but he always manages to right himself. We’ve been practicing in the yard and I think he’s getting the hang of it, though sometimes he just jumps in little circles. I asked him if he would have preferred shorter legs but he said no. When I asked him why he said he likes his long legs because they let him jump higher so he can see more of the world. The pirate ship crashed into the living room. If the window hadn’t been open it probably would have smashed the glass, instead it swooped against the side of the couch and hit the coffee table. My mom said she didn’t want to waste money on an exterminator because they always charge by the size of the ship and not the number of pirates, and this ship was about as tall as the couch but had a fairly small crew. I helped her gather up all the small objects and books in the room so they wouldn’t plunder, and then we left them in there with the doors closed and the window open. 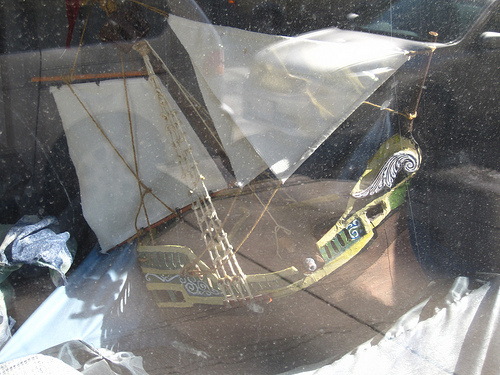 I overheard the pirates arguing as they surveyed the damage, apparently they had been attempting to commandeer one of the cars parked outside but the breeze pulled them too far toward the house. 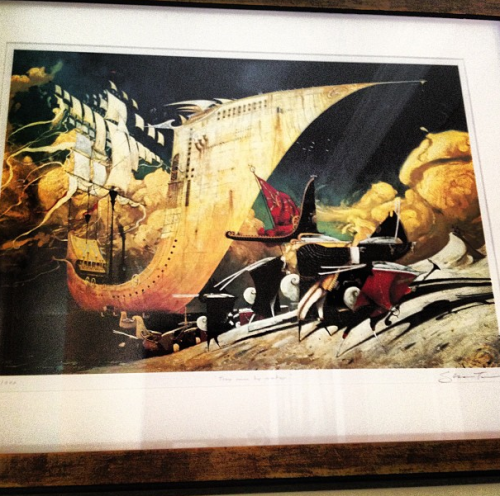 Strange tides, one of the pirates kept muttering, strange tides. I didn’t see them leave, but I heard the neighbor’s car alarm in the middle of the night and in the morning the ship was gone and there was no sign of them except the broken coffee table and the tiny empty bottles of rum. I’ve had an insanely busy week and I was going to write a long involved post about cocktails with photos and things but I just don’t have time. So that will be forthcoming. Soonish. In the meantime, randomness collected in themeless post form. Mostly links. I’ve been posting more on my new(ish) tumblr page, which I’m loving for images and inspirations. I think half of the tumblr blogs I’m following (and therefore lots of what I’m reblogging) are all abandoned architecture, but I like abandoned architecture. Also I find it strange that my spellcheck knows how to spell tumblr. I’m not caught up on all the episodes but I’ve been loving the BBC Radio adaptation of Neil Gaiman’s Neverwhere. Also it’s spring, yay, even though it doesn’t feel particularly springy yet and it was snowing the other day. I really need to go back to working even though this post isn’t particularly substantial. Ah well. At least there are links. We tried to get the snow to come inside so we could keep it. So we would have it to play with on too-hot summer days. We left the door open but other people kept shutting it. 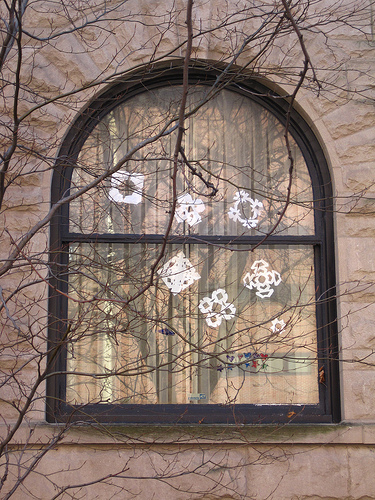 The windows wouldn’t open so we made paper snowflakes and taped them to the glass. We figured that the outside snow would see the paper snow and be intrigued and also know that snow was allowed to come in the house. When that didn’t work we went outside and talked really loudly about how great the inside of the house was compared to the yard and how snow would just adore the wallpaper in the downstairs parlor and oh, aren’t the chairs in the dining room so comfortable that they simply must be sat on? But that didn’t work either and then the snow stopped so we went inside for tea. We left the paper snowflakes on the windows, so the snow will remember us when it comes back. 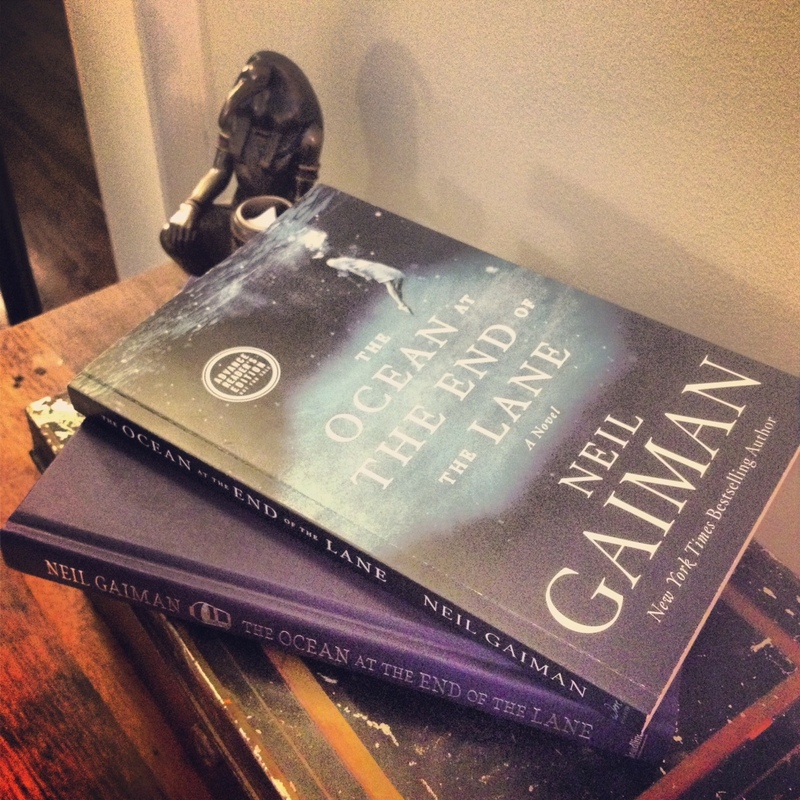 So last week the power of Twitter manifested Neil Gaiman’s upcoming The Ocean at the End of the Lane. Also wondering who I have to make out with to get an advance copy of The Ocean at the End of the Lane and if I capitalized that properly. Truthfully I thought maybe someone at his publisher would have a spare ARC, and if I were lucky I’d get one in a few weeks. Top one is the US version (I love that cover) and the hardcover beneath it is a special edition proof from the UK. They are both beautiful and they are being treasured and petted and read. I am a very, very lucky girl and I didn’t have to make out with anyone, but if any of the lovely people who led to this want to take me up on that, that’s totally cool. I curled up with it over the weekend and I wasn’t sure what to expect because I knew nothing about it. Read it in one sitting and loved it. As I said on Twitter afterward, it is soaked in myth and memory and salt water and it is so, so lovely. It feels as though it was always there, somewhere in the story-stuff of the universe, and I’m glad Neil captured it on paper so well. And it made me want to write again. I’ve been working, sorting through notes and drafts and the last of the cardboard boxes, but I haven’t really been doing much raw storytelling writing in that itchy to put things on paper way and this lit that spark again, which is impressive since it lit it with water. And I got to email Neil Gaiman and thank him personally for that, which is delightful and yet more proof that Twitter is magic. So I have had oceans on the brain and then yesterday my teal chairs finally, finally arrived (they’d been held hostage in a warehouse and no one thought to call to arrange delivery until they were inquired about, several times) and they are even more gloriously teal and deco than I’d expected and I love them. 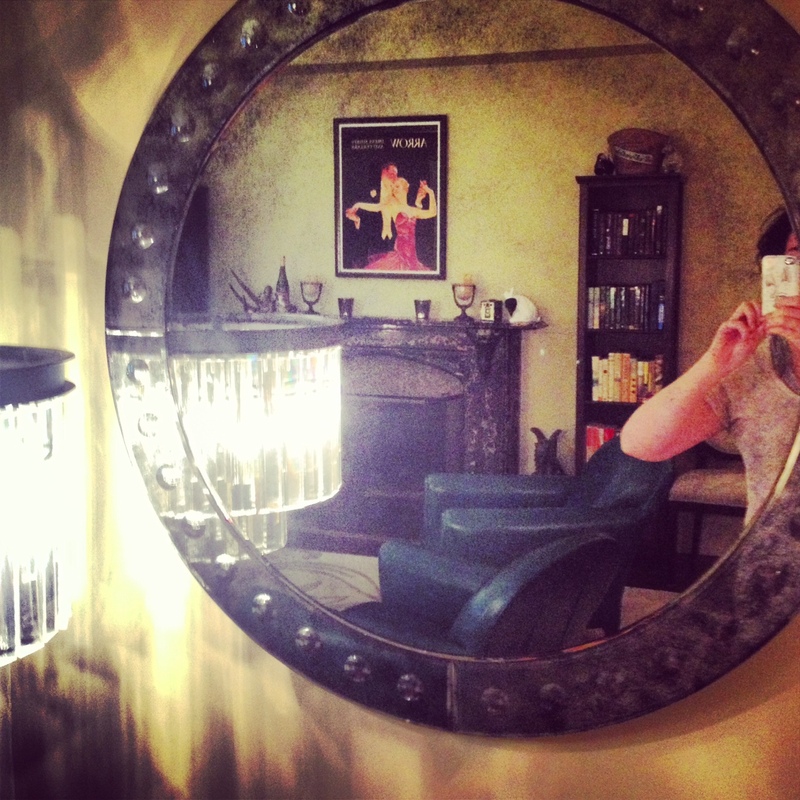 And they made me realize that my decorating concept is basically Bioshock. I can think of worse decorating concepts than “underwater art deco city.” And I like it, it’s cozy. It’s a flavor I can work in. I’d been thinking about the new novel as an air and glass sort of thing, where the circus was very much paper and fire and earth. And it has been curled up near the sea but I hadn’t thought of it as a water creature until now, and in its way it really is. It’s very much like figuring out the soup you are cooking needs more salt. It seems too simple but it’s true. It took oceans on the brain and teal chairs to realize it, even though I think it was there all the time. Now that I’ve finally had the time to write I’ve been gathering up all my ideas and bits and pieces of scrawled drafts and I’ve been dipping my toes back in to get myself re-acclimated. I think I hadn’t been sure what this story was or wanted to be and over the last week I’ve had a couple of those salt water epiphany sparks and while I don’t know what it wants to be, exactly, I have a better idea. I figured out over the last two years that while I can write little bits of things I can’t develop a whole novel-world unless I can shut everything else out and live in that world. I need that full-on imagination submersion. And for various reasons I’m only now getting to the point where I can do that. I’m remembering how to breathe underwater so I can properly submerge myself. I know I have something here, and I want to get it right. And who bear burdens not their own upon their backs. Prayers for strength of body and mind. 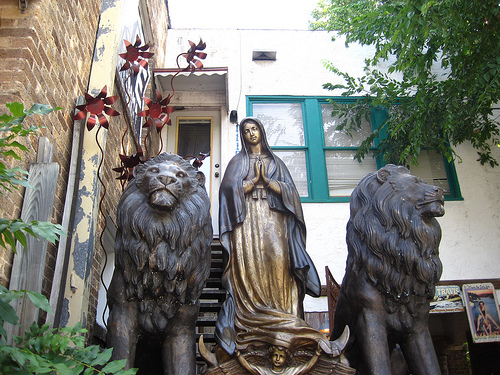 The saints guard you as well. So I asked Twitter if I should have a tumblr since it’s the one other social media thingamajig that intrigues me and the general consensus was that it would eat all my time but I should have one anyway, so I do now even though I haven’t figured out what to do with it yet. I suspect it will take me a while to get the hang of it. I also believe I promised a picture of the scarf I had been working on forever that’s the first thing I’ve knit in ages. 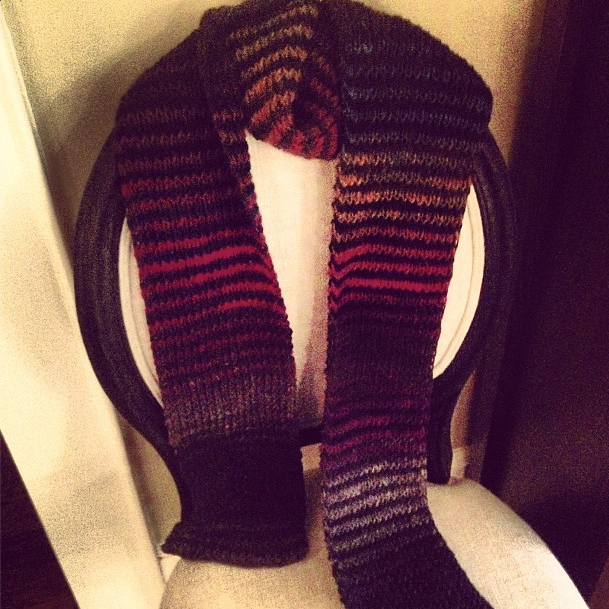 It’s several different variegated Noro yarns striped in a 1×1 rib pattern because I am a knitting masochist and also I like knitting things that look cool but don’t require much math or counting. In other news, I am finally almost to the point of being caught up with things and unpacked that I’d wanted to be at the end of January, so that’s something. I am having ideas about things and generally in one of those buzzy moods that comes from being extra creative and also eating too many Cadbury mini-eggs. Went to the Morgan Library over the weekend and saw their lovely Drawing Surrealism exhibit and it jostled my imagination in just the way I’ve been itching for something to jostle it. So I have a sugar & surrealism infused brain and a scarf and a tumbly tumblr and almost all of my furniture (my teal chairs are being held hostage) and somehow it is March. All strange but all good, I suppose. I noticed the neon sign in the kitchen before I went to bed, in that too-tired haze that also leads to mistaking the cat for a dragon. (Though I have seen the cat breathe fire, even in mid-afternoon. I don’t know much about cats and my roommate says it’s just a trait of the breed, whatever breed it is.) So I thought maybe I imagined it. 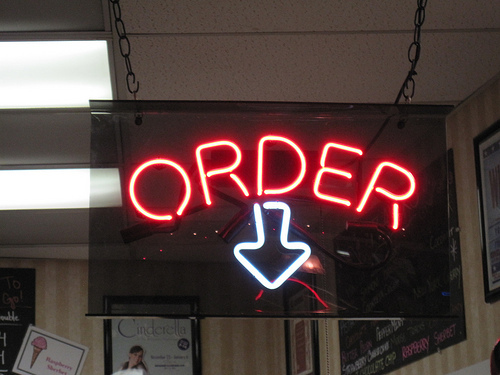 But in the morning the neon sign was still hanging from the ceiling in the kitchen and while I got my coffee I wondered what “REDRO” meant and then I realized I was looking at the back and it really said “ORDER” in glowing red over a white arrow pointing down accusingly at an unassuming square of linoleum near the sink. “What’s the sign for?” I asked my roommate when he shuffled in wearing his bunny slippers with the dragoncat draped around his shoulders. The cat sneezed a little puff of smoke. I figured it was for ice cream or pizza, but it works for anything.